The park Friesian Wadden in Tzummarum you can enjoy our comfortable five-person holiday homes, # 47 and # 73. • Cozy living room with lounge sofa, dining area and patio doors to the garden. • Large (80cm) flat screen TV, DVD player and DVD collection. • Well equipped kitchen with large refrigerator with freezer, gas stove, oven, microwave, coffee maker; Senseo, kettle and lots of storage space. • Bedroom with two box-spring beds, reading lights and alarm clock. • Bedroom with bunk bed (140 x 200) and single bed (90 x 200). • Both bedrooms have storage space, mosquito nets and a cot. You can enjoy our 4 comfortable holiday homes at the peaceful holiday park De Friese Wadden in Tzummarum (near the Wadden Sea). The houses nr 43, 47 and 73 are next to each other. And chalet nr 115 is also close by. Therefore, the cottages are also very suitable for a cozy holiday with friends or family (up to 18 people). 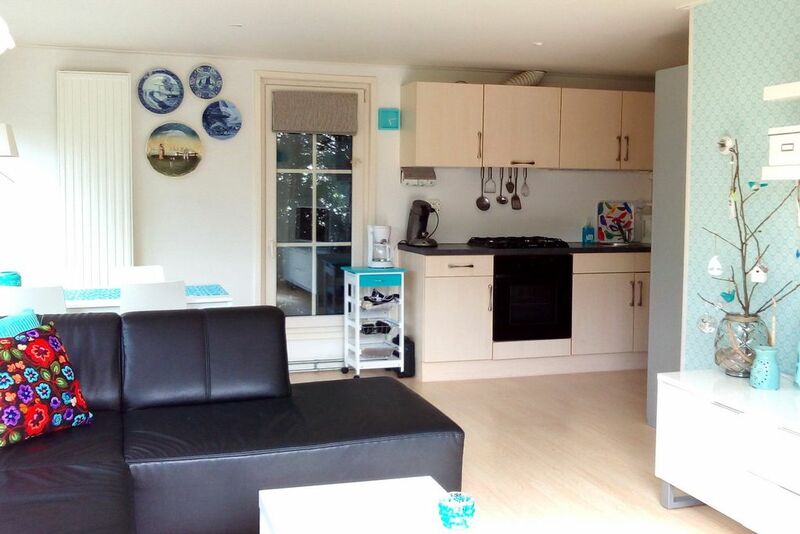 This is a 4 person cottage on the edge of the park, with a large beautifully landscaped garden. • Large, beautifully landscaped garden with various seating areas. • Parking space at the cottage. • New washer / dryer in the cottage. • Use of 2 bicycles. • Attractive bright living room with comfortable couch, 2 armchairs, cozy dining area, and patio doors to the garden. • Large (80cm) new flat screen TV with Ziggo cable connection, DVD player and DVD collection. • Well equipped kitchen with fridge with freezer, gas cooker, combined oven / microwave, coffee maker, Senseo, kettle and plenty of storage space. • Bathroom with washbasin, shower cabin and washing machine / dryer. • Separate toilet with fountain. • Bedroom with double bed with 2 mattresses, 2 spacious closets, reading lamps and alarm clock. • Bedroom with bunk bed for 2 persons, spacious mirror cabinet and cupboards under the bed. • The bedrooms have duvets, pillows and mosquito screens. • Large (400 m2), beautifully landscaped garden, with romantic gazebo, various seating areas, comfortable garden furniture with cushions, parasol, lounger and lounge chair. You have a lot of privacy in the garden. • Shed with o. A. 2 bikes that you can use free of charge. • A combi-boiler heats all areas and provide hot water. • In the cottage you will find practical and tourist information. Including the beautiful Capitol guide 'Friesland'. Inspiration for plenty of adventures! Our comfortable holiday homes, nr 47 and nr 73 are next to each other. They are 5 person houses. • Cozy bright living room with comfortable lounge sofa, cozy dining area, and patio doors to the garden. • Large (80cm) flat screen TV with lots of channels via cable, DVD player and collection of DVDs. • Free use of Wi-Fi (via Ziggo). • Well equipped kitchen with large refrigerator with freezer, stove, oven, microwave, coffee maker, Senseo, kettle and plenty of storage space. • Bedroom with two box-spring beds, storage space, reading lamps and alarm clock. • Bedroom with bunk bed (140 x 200) and large single bed (90 x 200) and storage space. • The bedrooms are fitted with mosquito nets. • Sheltered and enclosed garden with comfortable garden furniture with cushions, parasol, sun bed and lounge chair. • Loading and unloading can doorstep. Parking at the nearby car park. • In the cottage you will find practical and tourist information. Including the Capitol guide Friesland. Inspiration for plenty of adventures! • Attractive bright living room with comfortable lounge sofa, armchair, cozy dining area, and patio doors to the garden. • Large flat screen TV with many channels via the Ziggo cable, Humax TV receiver, DVD player and DVD collection. • Well equipped kitchen with fridge with freezer, gas hob, combined oven / microwave, coffee maker, Senseo, kettle and plenty of storage space. • Bedroom with double bed with mattress of 140 x 200 cm, 2 cupboards, reading lamps and alarm clock. • Bedroom with bunk bed for 2 persons (mattresses of 70 x 200), cupboard space. • Spacious garden, with comfortable garden furniture with cushions, parasol, 2 sunbeds. * You can bring your own bed linen or rent it at the park at € 7.50 per person per change. * You must bring your own towels, kitchen cloths and tea towels. HOLIDAY PARK "DE FRIESE WADDEN"
Address of the cottages: Birds' Tun 43, 47 and 73, 8851 HT in Tzummarum. Park De Friese Wadden is located in the quiet village of Tzummarum, a stone's throw from the Wadden Sea. But also near the beautiful towns of Franeker and Harlingen. Capital Leeuwarden (2018 European Capital of Culture) is also easily accessible. You can explore enjoy the beautiful views in the characteristic Frisian landscape, taking long bike rides, the beautiful Frisian towns and villages by boat or sail the Frisian waters. The park has a reception, swimming pool, playground and snack bar. Right next to the park there is a tennis court. You can cycle through the park and rent a boat, tennis, horseback riding. You are most welcome in our holiday home: Fries-Waddenhuisje! At holiday park 'De Friese Wadden' in Tzummarum you can enjoy our comfortable holiday cottages, nr 47 and nr 73. Suitable for max. 5 persons per house. Because the houses next to each other, they are also great for a cozy holiday with friends or family (up to 10 persons). We bought, renovated and newly furnished and decorated the houses in June 2016. The cottages of about 48 m2 are in June 2016 almost identical equipped with: • attractive bright living room with comfortable lounge sofa, cozy dining area, French doors to the garden. • Large (32 inch) flat-screen TV with cable channels, DVD player and DVD library. • Free use of Wi-Fi • Well equipped kitchen with large refrigerator with freezer, gas stove, oven, microwave, coffee maker, Senseo, kettle and enough storage space. • Bathroom with washbasin, shower and toilet • Bedroom with two box-spring beds, storage space, reading lights and alarm clock. • Bedroom with bunk bed with double bed (140 x 200) and large single bed (90 x 200) and storage space. • The bedrooms have mosquito screens. • Sheltered and enclosed garden, with comfortable garden furniture with cushions, parasol, sun bed and lounge chair. • Shed. • A combi central heating boiler heats all areas and provides the hot water. • You can unload and load your car in front of the door. You park your car on the carpark nearby, free of charge. • In the cottage you will find practical and tourist information. Inspiration for plenty of adventures! Kleines nettes Ferienhäuschen-wir würden es wieder buchen. Super Preis-Leistungsverhältnis und himmlische Ruhe! We have loved our week at this love holiday house. The fact that it our puppy was unable to escape made our week so much more relaxing. The kids enjoyed the pool, new adventure playground and snack bar on site. The bakery in the village provided deliciously crusty bread roll and other goodies. The owner were super helpful with any queries. Many thanks. Thank you very much for your stay and for your very kind feedback! Schöne Anlage. Haus könnte etwas Mücken Schutz gebrauchen, fliegengitter im Schlafzimmer haben Löcher, viell ein Vorhang für den Eingang, aber sonst tolles Haus für den Urlaub. Wir werden wieder kommen. Es war sehr schön ruhig. Für uns als Radfahrer absolut geeignet! Het huisje is heel gezellig ingericht, met een lekkere loungebank, fijne bedden en een grote oven. In de tuin kun je lekker van de zon genieten. De hond kan niet ontsnappen want de tuin is helemaal omheind. Het dorp is rustig met een lekkere bakker. In de omgeving kun je lekker fietsen, tussen de schapen wandelen langs de mooie Waddenzee en er zijn veel mooie steden en dorpen met leuke winkels en musea. Das Haus war inordnung, nur lebt man dort wirklich auf dem Dorf. Das Meer war auch nur ein Wattenmeer. Für Menschen die nicht in die Städte müssen, ist es auf alle Fälle gut geeignet. Vielen Dank für Ihr Besuch an unserer Fries-Waddenhuisje und für Ihren Kommentar. Für nächtste Gäste: Es stimmt, dass das Haus in einem ruhigen Dorf in der Nähe des Wattenmeer ist. Das sagt auch unserer Anzeige. Wen Sie der Stadt lieben (tun wir auch), sind schöne Stadten im der nähe. Z.b. Franeker 10 Minuten, Harlingen 15 Minuten und Kapital Leeuwarden 20 Minuten beim auto. Das Nordsee strand ist beim Harlingen. The cottages are located on the quiet holiday park De Friese Wadden in the village of Tzummarum. A small quiet village, with plenty of entertainment in the area. E.g. the beautiful cities Franeker (6 km), Harlingen (10 km) Leeuwarden, the cultural capital of Europe in 2018. The beautiful nature reserve the Wadden Sea is nearby (about 1.5 km). You will find sandy beaches at Harlingen and Makkum. At a short distance you will also find nature pond Slappeterp, a free cozy outdoor swimming pool. EXTRA KOSTEN Bij aankomst betaalt u aan de parkreceptie: * Schoonmaakkosten: € 45 en € 60 met huisdier * Borg: € 100. Bij vertrek ontvangt u deze borg retour. Mit u het huisje in dezelfde staat achterlaat als u het heeft aangetroffen natuurlijk. PRIJS IS INCLUSIEF: gas, elektriciteit, water, Wi-Fi (via Ziggo), TV/CAI, park- en servicekosten, (toeristen)belastingen, parkeren op de parkeerplaats van het park. BEDLINNEN kunt u zelf meenemen of huren bij het park ad € 7,50 per persoon per wissel. ********************************************************************************************************** ZUSCHLÄGE Bei Ihre Ankunft zahlen Sie Parkrezeption: * Endreinigung: € 45 und € 60 mit Haustier * Kaution: € 100. Bei der Abreise erhalten Sie diese Kaution zurück, wenn Sie das Haus im gleichen Zustand verlassen, wie Sie es gefunden, natürlich. Im Preis inbegriffen: Gas, Strom, Wasser, Wi-Fi (Ziggo), TV / CATV, Park und Service-Gebühren, (Tourist) Taxe, Parken auf dem Parkplatz des Parks. BETTWÄSCHE können Sie selbst mit nehmen oder mieten im Park für € 7,50 pro Person pro Wechsel. ***************************************************************************************************************************** EXTRA COSTS: Upon arrival you pay to park reception: * Final cleaning: € 45 and € 60 with a pet * Security deposit: € 100. On departure you will receive this deposit back, if you leave the house in the same condition as you found it, of course. PRICE INCLUDES: gas, electricity, water, Wi-Fi (via Ziggo), TV / CATV, park and service charges, (tourist) tax, parking in the parking lot of the park. BED LINEN You can bring your own or rent it at the park for € 7.50 per person per change.